The System One produces distinctive documents that convey quality and professionalism. It is the perfect system for low to moderate volume users who desire a secure binding style. Each document looks custom-bound by utilizing GBC's VeloBind(R) automatic binding system. The GBC VeloBind V800pro (formerly the GBC VeloBind System 1) offers the most secure binding style with the same professional, book-like finish as GBC's regular Velobind systems, but now with added protection. The GBC V800pro Velobind System One uses hot knife technology to permanently lock pages into place, keeping confidential projects safe. Transcript: This is the GBC V800pro Velobind System One Binding Machine! The bottom tray slides out with opperating instructions, so I’ll simply be following those—the tray is also catches the trimmings to be thrown away. First, adjust the edge guide in the punch area for the correct sized paper. Then insert your pages into the slot—it can punch 20 sheets at a time. Pull the lever down and make your punch. If you have a thicker project, continue to punch the rest of the pages. This is the GBC V800pro Velobind System One Binding Machine! Now place the binding strip onto the machine—match the extra small hole where it is marked “pin”. Also place it down so the nice textured edge is facing down. With your project completed and in order, place it on top of the strip facing up. If you are using 11 x 8.5 paper you can line up the left hole with the line here, the adjust the edge guide for consistency. Now insert the spike strip into the holes. Pull the pressure bar over the project and down onto it. Wait for the light to turn on, and the machine with cut the extra strip and seal the binding together. Lift the bar up and you have a completed Velobind project. Transcript: The System One is designed to stand up to years of use. GBC uses only quality components, such as a die-cast aluminium pressure bar. The Teflon coated cutting blades are made from special steel designed to withstand high temperatures. And the punch-pins are constructed out of harden steel. The System One is designed to stand up to years of use. GBC uses only quality components, such as a die-cast aluminium pressure bar. The Teflon coated cutting blades are made from special steel designed to withstand high temperatures. And the punch-pins are constructed out of harden steel. In the unlikely event that a problem does occur, you can count on GBC’s network of highly trained technicians to get your system back up and running. Transcript: Operators can punch up to 25 sheets of paper per lift with the System One. The flat punching surface allows the operator to align paper easily and the punch edge guide allows for evenly -aligned punching every time. Operators can punch up to 25 sheets of paper per lift with the System One. The flat punching surface allows the operator to align paper easily and the punch edge guide allows for evenly -aligned punching every time. A full sized binding surface maintains page position during binding and the indicator light shows while binding is in progress. In less than 10 seconds, the binding is complete and the indicator light goes out. The GBC V800pro is a hot knife Velobind binding system that permanently binds using eleven pin Velobind strips. In fact, this machine uses heat to securely rivet the pages of your documents in place. It is the introductory model to GBC hot knife binding and is designed for low to moderate volume users books that are up to one inch thick. Also known as the GBC Velobind System One, the V800pro provides a highly secure and professional finish to your most important documents. This makes it especially popular with government agencies, lawyers, accountants and financial service companies who are looking to prevent users from tampering with their documents. The Velobind system one offers a medium duty manual punch. When I tested my demo unit here in the office I was able to punch 23 sheets of 20lb paper. However, the handle was difficult to pull down. I would suggest punching between 15-18 sheets with this machine. The punch is also able to punch clear covers and plastic poly covers. However, you should only punch two plastic covers at a time. The U shaped punching handle included on this machine was easy to use and is excellent for both right and left handed individuals. The V800pro can bind documents up to one inch thick. One of the great things about this system is that you only need one style of strip for any document thickness up to one inch. With other punch and bind systems you need a different size of spine for every different size of document that you bind. This machine uses the same eleven pin hot knife spine to bind any document up to one inch. This significantly cuts down on supply costs and space issues that are created by stocking a large variety of binding supplies. The bind produced by this machine is incredibly secure. After punching your document you place the Velobind comb through the holes and through the receiving strip and then load everything onto the binding machine. The V800pro will cut off the excess portion of the pins and uses heat to rivet the strip in place. Once a document is bound with this binding system, the only way to edit it is to cut the binding strip using a debinding tool. GBC Velobind provides the ability to create highly professional presentations and proposals. In fact, it is one of the most professional binding styles on the market. Using the V800pro it is possible to create high quality, impressive bound documents, reports and presentations with your own customized binding covers. One of the main limitations of the V800 pro is the thickness of documents that it can bind. Although Velobind is capable of binding documents up to three inches thick, this machine is only designed to bind documents that up to one inch thick. Users who need to bind documents that are thicker than one inch will need to consider the Velobind System Two or Three. One inch Velobind strips are available in a limited number of colors and lengths. Although the System One can punch virtually any length of document up to fourteen inches in length, the lengths that you can bind with this machine are limited by the strips that are available on the market. A number of different colors are available for binding letter sized documents. However, if you want to bind either legal or 8.5″ documents you will be limited to black spines. Other lengths of Velobind spines are simply not available. Organizations that need to bind lengths other than 11″, 14″ or 8.5″ should not choose this system since the supplies are simply not available. Although the security offered by this system is a definite plus it can also be a pain if you need to edit your documents. A special Velobind Debinding tool is available to help you safely cut the strips off your documents for editing. Users of this system should really consider purchasing this tool. Attempting to use a razor blade knife or other sharp implement to debind a document bound with Velobind can be extremely dangerous. The debinder tool offers a protected blade that will keep your fingers safe during the debinding process. 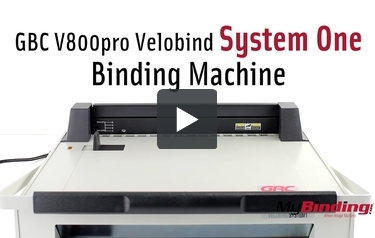 The Velobind V800pro is an excellent binding system for small to medium sized organizations that are looking for a highly professional binding system. This system offers the ultimate in security and allows users to use a single size of binding strip for creating documents up to one inch thick. However, organizations that need to bind documents that are thicker than one inch or who need to bind custom document lengths should probably consider a different binding system. This system is ideal for light volume binding users who need to create a few dozen documents per week. Larger users who need to bind multiple reports on a daily basis may want to consider a larger machine with an electric punch such as the Velobind System Two.